Was the Shot that Killed President Kennedy fired from in front or behind him? Some people might bet that the shot that hit President Kennedy was fired from in front of him. Others are equally sure that the US government’s conclusion of three shots fired from behind and one lone gunman is the correct scenario. Who is right? Without rehashing what numerous books, TV documentaries and other sources that are too numerous to list have said, let’s evaluate the question in a different way than you’ve ever seen done before. FACT: There are two independent ways to determine the time between shots in the assassination of President Kennedy. METHOD #1: Looking at the Zapruder film, let’s determine the time between two of the shots. The shot that killed President Kennedy was fired at frame Z313. Another time in the Zapruder film that a reaction to a shot can be seen is shortly after John Connally emerges from behind the sign. That time is generally agreed to be at frame Z224. 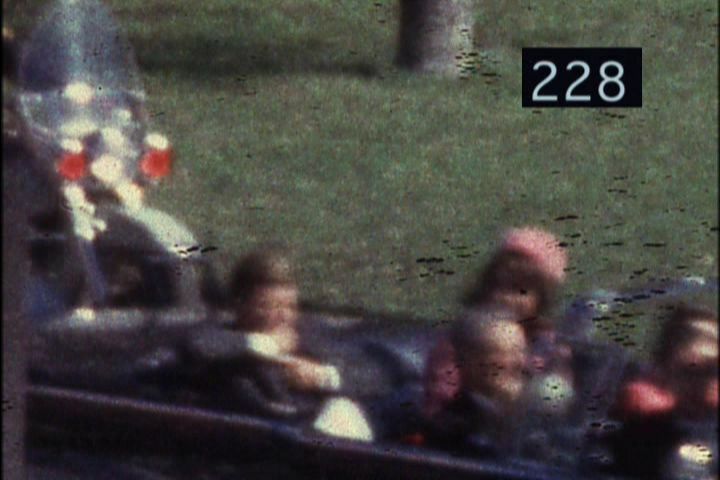 The film speed of Zapruder’s camera was measured to be about 18.3 frames per second. To calculate the time between the shots at Z224 and Z313, simply divide the number of frames by the film speed. METHOD #2: The second way to determine the time between shots uses the only audio recording that was made during the shooting that might have captured the sounds of the shots. This recording was evaluated by audio experts during the House Select Committee on Assassinations (late 1970’s). The next figure shows the results of that audio recording with an added correction made in 2000. As can be easily seen, the time between shots #3 and #4 is 4.8 seconds, just like the Zapruder film shows for the time between shots at Z224 and Z313. The time of 4.8 seconds being in both the Zapruder film and acoustical evidence is not sufficient to prove that the sound recording did actually have the sounds of the shots recorded, that number of seconds in both methods could be a coincidence. To show it is not, examine the time between shots #4 and #5 which the above figure shows is 0.7 seconds. If the last two shots were indeed fired a split second apart, then at least some of the witnesses would say that is what they heard. And, if the last two shots both actually hit someone, it would be expected reactions could be seen in the Zapruder film. 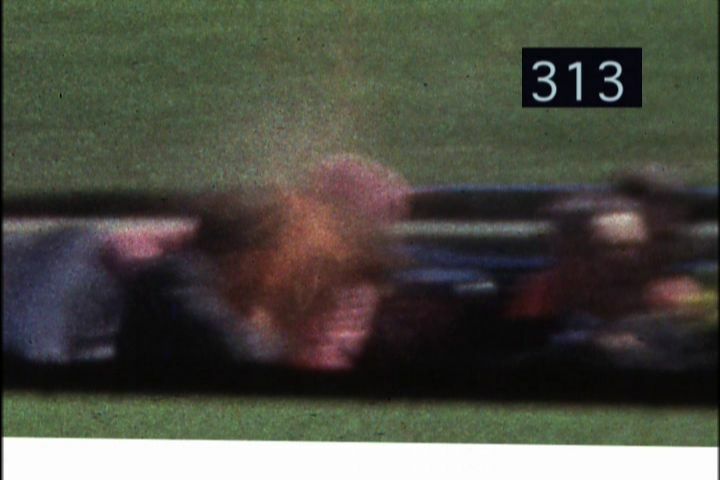 As stated earlier, shot #4 is the one that was fired at Zapruder frame 313. What happened 0.7 seconds after President Kennedy was shot in the head? A line drawn through the back of John Connally’s head shows he was rapidly bent over forward starting 0.7 seconds after President Kennedy was shot in the head. This series of Zapruder frames starts 2 frames before the shot to Connally’s back was fired. At about 18 frames per second, it can be seen that John Connally was rapidly bent over when the last shot was fired. The Warren Commission concluded that John Connally was shot in the back about Zapruder frame 224 when he first reacted to a shot. One of the many problems with that conclusion is that John Connally always said “the blow to my back bent me over.” Reviewing the Zapruder film reveals that John Connally is not bent over forward until a split second after the head shot to President Kennedy. This series of Zapruder frames shows that John Connally was bent over forward starting at Zapruder frame 325 which is 0.7 seconds after the JFK head shot. 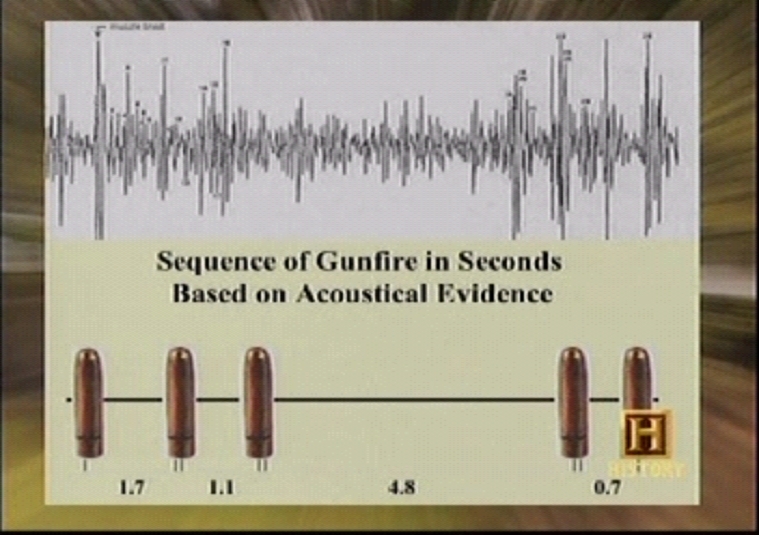 The acoustical analysis shows that the last two shots were 0.7 seconds apart. John Connally said the blow to his back “bent me over.” The series of Zapruder frames above shows that John Connally was quickly bent over a split second after President Kennedy was shot in the head. Reviewing the Zapruder film from the sign all the way to the JFK head shot shows John Connally was not bent over forward until after the JFK head shot. The last two shots were fired 0.7 seconds apart. The Zapruder film shows the first hit President Kennedy in the head and the last shot hit John Connally in the back bending him over forward. If the last two shots were fired a split second apart, then some of the witnesses would probably have heard that. The first witness, Patsy Paschall says she heard pow then a pause then pow-pow. Witness James Tague heard a pop THEN the crack-crack of two rifle shots. It turns out there are dozens of witnesses who heard the last two shots fired BANG-BANG. Many of the witnesses who heard BANG-BANG for the last two shots are included in the population of those who said they only heard three shots. But which group of three shots did they hear? Some heard three equally spaced shots, some heard a shot, a delay then BANG-BANG. These two groups of people only heard three shots but the sequences they describe are very different from each other. The next video clip shows how CBS taught Americans to ignore the witnesses. Dan and Walter edited out what was said about BANG-BANG by all but one witness. The message here was there is no consistent pattern from what the witnesses told us when there actually is a pattern of BANG-BANG was heard by many people. Dan Rather and Walter Cronkite were not part of the conspiracy to hide the truth, they were just useful idiots that hid the truth. To prove the US government forged evidence to hide the truth will take more information than has been presented here. This is an introduction to showing you that you have been lied to for over a half century. And why not lie? The US press will never figure it out, they are useful in telling the public what the government leaders want you to know and also hiding what they do not want you to know. To determine the truth in the assassination of President Kennedy, you must not use any of the US government’s evidence or investigation information without verifying that it is not forged. Saying it another way, to solve the Kennedy assassination mystery, you can only use evidence that the US government could not have forged. To prove what happened, many of the “facts” out there about the JFK assassination will have to be examined. Some of the conflicts with the above sceanrio are easily answered. For example, in the Connally video clip above, John Connally says he was shot in the back and bent over. Then he says President Kennedy was shot after that. To address that conflict, it’s only necessary to observe that when President Kennedy was shot in the head, Governor Connally was facing forward and he could not see President Kennedy. How did Connally know when JFK was shot in the head? Because Connally says the shot to his back bent him over, we know President Kennedy was shot in the head a split second before Governor Connally was shot in the back and that Governor Connally got the order of what he heard incorrect. To prove the shot to President Kennedy’s head was fired from in front, we have to understand how the study of the audio recording was done. But don’t worry, the acoustical experts said with a 95% (or better( probability the shot that hit President Kennedy in the head (shot #4) was fired from the right front of JFK.